Reading the Bible has been and continues to be a source of meaning, wisdom, purpose, and comfort for many millions of people. Through Scripture, believers draw close to God, are inspired to help others, and find direction and strength for their daily lives. Unfortunately, in our modern tech-driven society, reading books is becoming something of a dying art, and for various other reasons understanding the Bible has become especially challenging for many people. Its books were written two thousand and more years ago in the ancient Middle East and Mediterranean cultures. It deals with subjects that transcend ordinary human experience such as the nature of God. Modern readers often find parts of the Bible difficult to understand or accept. To make matters worse, some religions teach distorted views of the Bible that can alienate their members to its teachings. In this series of articles, we will offer some help to those struggling to understand and benefit from the Bible. Our intent here is not to try to dictate what you should believe, but rather to offer some guidelines and recommend some good resources that you may find useful in your reading of Scripture. Future articles in this series will address such questions as how to understand the different parts of the Bible, how to read statements in context, how to deal with figurative language, how to draw applications, and other such common issues. These articles along with supplemental resources can also be found on our website at our Bible Study page. In this article, we will make some basic suggestions that may help you to get the most out of your reading of the Bible. The adage that if you aim at nothing you will hit it every time applies to the reading of the Bible. Occasionally dipping into the Bible at random places is not always bad, but it isn’t a reliable way of approaching the Bible. What we all need is a plan—a regular, structured way of reading the Bible. 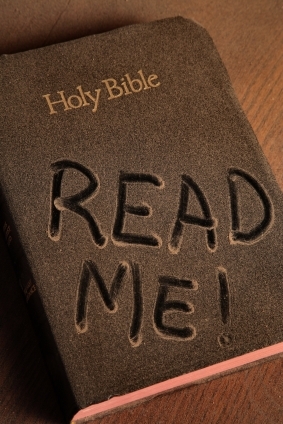 Many people have a daily “quiet time” in which they read the Bible for a few minutes. That’s a good idea, but if you really want to understand the Bible and get the most out of it you also need to set aside more sizable periods of time to immerse yourself in your reading. It doesn’t need to be every day, although that would be wonderful, but it does need to be a serious, sustained time of reading. (You can also listen to audio recordings of the Bible.) I recommend that you set aside at least an hour once a week, or half an hour twice a week—more if possible. Although some people are more successful in their reading if they observe a regular schedule, the important thing is to do it. Anything less than an hour a week just doesn’t give the Bible a chance to become a significant part of your life. Frankly, some kinds of Bible reading and study simply cannot be done in short bursts of time. In addition to devoting the necessary time to reading the Bible, you need to read the Bible in a structured way. Most of the Bible is not written as a collection of individual sayings (although most of the Book of Proverbs is just that! ); the books of the Bible are generally meant to be read from beginning to end, or at least in larger sections than individual sentences or verses. People often complain about statements in the Bible being taken out of context; the only way to avoid this problem is to read whole passages and books of the Bible so that we can see how individual statements fit into their contexts. Try reading the whole Book of Jonah in one sitting, or all of the Sermon on the Mount (Matthew 5-7) in one sitting. You’ll get the big picture and see things in a much clearer way. Although I have emphasized the importance of reading longer passages and even whole books of the Bible, there is a place for short, individual sentences or verses. Most Christians have memorized some verses of the Bible and find this to be an extremely beneficial exercise. It is highly valuable to memorize verses that summarize key truths (such as John 3:16, perhaps the most memorized verse of the Bible) or that are important reminders of God’s promises and commands. It is also a good idea to pick out a line or verse from the passage or book you are reading and memorize it as an “anchor” for that part of your reading. For example, if you are reading the Book of Acts, you might memorize Acts 1:8, which functions nicely as a summary of the entire book and also is a reminder to us that we have a mission to reach the world for Christ. It’s also helpful to memorize the names of the books of the Bible in order, simply because that will help you find your way around and give you a good feel for the overall contents of the Bible. If you have trouble with memorization, don’t feel badly and don’t worry about it. Reviewing the same material regularly will help you remember a lot of it even if you can’t recall the exact words or the chapter and verse references. If your daily quiet time only allows you a few minutes with the Bible, I suggest using that time to read over the key verse you have chosen (perhaps you will have one for the whole week) and to reflect on its meaning and importance. That is what the Bible calls meditating on God’s word. The Scripture will gradually become ingrained in your mind even if you haven’t technically memorized the whole verse and its reference. Another valuable exercise in reading the Bible is to take notes. Although very short notes and comments can be written in the margins of your Bible, you need to be able to write more extensive notes. These can be simply questions that come to your mind as you are reading (Who was this fellow “Theophilus”? ), other biblical texts that seem related, or any information you want to remember. It is extremely helpful to outline the passage or book you are reading, since this will give you a bird’s-eye view of its contents and enable you to see how the parts fit into the whole. The old-fashioned way of keeping your notes is to have a Bible study notebook. This still works, but more and more of us will keep our notes digitally on our laptop or handheld device. There are many programs you can use to do this. There are even programs that give you the text of the Bible and places where you can write your own notes on the passages as you are reading them. A study Bible is an edition of the Bible with extensive resources that help the reader in understanding what they are reading. These resources typically include introductions, notes, charts, illustrations, timelines, maps, and the like. There are several excellent study Bibles available today. Probably the best one is the ESV Study Bible, which was produced by a team of biblical scholars and has a wealth of study resources. You can get a hard print copy of it, but you can also use it online. The related ESV Global Study Bible is currently free and contains many of the resources of the regular version. The ESV Online Study Bible provides various reading plans and daily devotionals, and it allows you to add your own notes. There is also the ESV Bible app, which includes full access to the ESV Global Study Bible, available for use on various mobile devices such as the iPhone. These ESV Bible resources are an example of the wealth of Bible study tools that are available, many of them free, for the person who is serious about getting the most out of their reading of the Bible. Bible Reading and Study Plans: Suggested plans for reading, studying, and memorizing Scripture, with guidelines for coming up with your own plans or finding plans you can access from your computer or mobile devices. Choosing a Good Study Bible: Recommendations of the best study Bibles available, along with a list of study Bibles we do not recommend and why. What are the best translations of the Bible?